One aspect of college football that makes the sport special is its overtime and the diverse ways that such a game can end. I decided to start this project where I would track every overtime game with the intent of finding all the unique ways an overtime game can end and the frequency of each scenario. The results are as followed and an explanation as to how I came to those results is below. Walk-off touchdown: This situation is similar to the three walk-off scenarios above where a team needs a touchdown to win, but with the added caveat of a defensive score such as a pick-six or a fumble returned for a touchdown. The defensive score is a rare play but it does happen. Turnover on downs rushing attempt: A player tries to covert a 4th down on a rush attempt and does not get it which ends the game. Turnover on downs sack: The quarterback is sacked on 4th down ending the game. Turnover on downs completed pass: On 4th down the quarterback throws a completed pass but it is caught short of the first down or endzone and the receiver is unable to convert. This is a rare scenario as quarterbacks tend to throw well past the first down marker or into the endzone on 4th down situations. In the three situations I did find it one was an attempted screen (Boston College-Virginia Tech 2012). One was a pass originally thrown into the endzone only to be tipped and caught at the 3-yard line (Iowa State-West Virginia 2013). The last was Iowa-Michigan State in 2007 which was a completely ill-advised throw as the receiver was tackled immediately for a six yard gain on a 4th and 13. Turnover on downs ending on a measure: In this scenario the offense comes very close to converting a 4th down. The referees call out the chain crew to measure the spot of the ball and determine the player does not have a first down ending the game. Technically this situation can be chalked up as a failed rush attempt or a completed pass attempt. But I decided to give it its own category as it is such an unusual situation. In theory it will almost always happen on a failed rush since coaches tend to call running plays on 4th and short. I was able to find two examples of it (UTEP-New Mexico in 2013) and Syracuse-Pittsburgh in 2004. Fumble on 4th down: I decided to separate 4th down takeaways and regular takeaways. On 4th down with the game on the line the offense has nothing to lose making them more careless with the ball. I also wanted to have the ability to combine all 4th down stops and all takeaways. 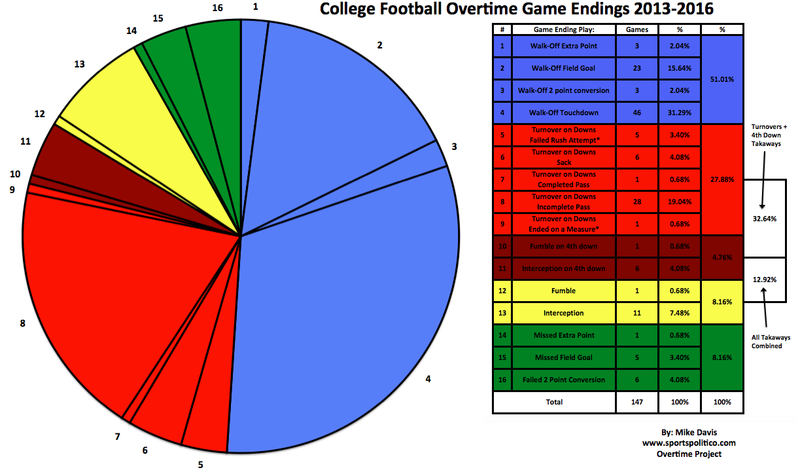 My final (and most difficult task) was to then classify each overtime game into one of these 16 categories. Jeff Bovee was able to use his scoring data to automatically classify 60% of the games by tracking the scoring pattern of each overtime period. That left me with 265 games whose classifications I had to track down manually. YouTube quickly became my friend as I started going through old games. I was able to get though the last four seasons with only a couple of missing games. Those missing games I had to use the more tedious process of tracking down box scores. Starting with the 2012 season YouTube had a noticeable decline in game availability and by the 2007 season I decided to throw in the towel altogether. I decided to use the data for the 2013-2016 seasons. While I had data from previous seasons, those seasons had a couple of missing games. Given that some situations are easier to track in news articles/box scores (interception verse a turnover on downs), I felt that I could not include a season unless I had every single game accounted for. Otherwise there would be a selectivity bias in the data. There were 147 games during this period of which 70 I had to track down manually. Improvements for next time: Obviously for next time the goal will be to add more years/games until I reach the 1995 season and have every game accounted for. I would have preferred to not include defensive scores as part of the walk-off touchdown category but instead make them their own category. But given that there is no way to separate an offensive touchdown from a defensive touchdown in a game box score, this could only be done manually. With 51% of all games being a walk-off touchdown, to do this would have been a massive time commitment. This is something I will try to improve if I ever do a Part II.